Looking at Miranda Kerr, we would follow any beauty advices she has to share. She recently launched a new range of skincare and food supplement based with Noni Fruit Extract. What made you decide to come up with a whole new range of Noni based products, both supplements and skincare? Noni has been a key ingredient in all my KORA Organics products since I developed the range over 10 years ago, but we never really highlighted it or it’s benefits well. So, when we were developing the new generation of products and packaging, we really wanted to highlight Noni as a key ingredient and something unique to KORA… along with its many benefits. Noni Extract is revered for its healing and rejuvenating properties, and is a powerful antioxidant – antioxidants are really important because they protect skin from environmental damage caused by free radicals, which leads to premature aging. We have built on the initial two products, the Noni Glow Body Oil and Face Oil, to add the Noni Glow SkinFood Supplement and more recently the Noni Glow Face Balm and Body Balm. We under took consumer studies with the Noni Glow Face Oil and I’m so proud of the results; 87% noticed that their skin looked brighter and more radiant after 1 week; 93% noticed their skin appeared more even-toned, with enhanced clarity after 2 weeks; 100% saw noticeable improvement in skin bounce and improved elasticity after 4 weeks and 93% saw noticeable improvement in the visible appearance of skin imperfections after 4 weeks. What are the benefits of Noni? On skin? On health? Taken internally, it also increases my energy levels, and it’s a great pick me up. I carry the Noni Glow SkinFood Supplement in my handbag and have one whenever I need an extra boost of energy. In addition to Noni it contains; Acai, Blueberry, Mangosteen, Pomegranate, Matcha Green Tea, Rosehip, Chlorella and Elderberry Flower. I personally love to drink my supplement every morning and love the taste. Is it ok for kids to drink it too? I am sure Romy would love it! All the ingredients and natural and safe – there is no added sugar, no preservatives, colours or flavours; but it is quite strong and potent, so as with any supplement you should consult your healthcare professional before offering to children. 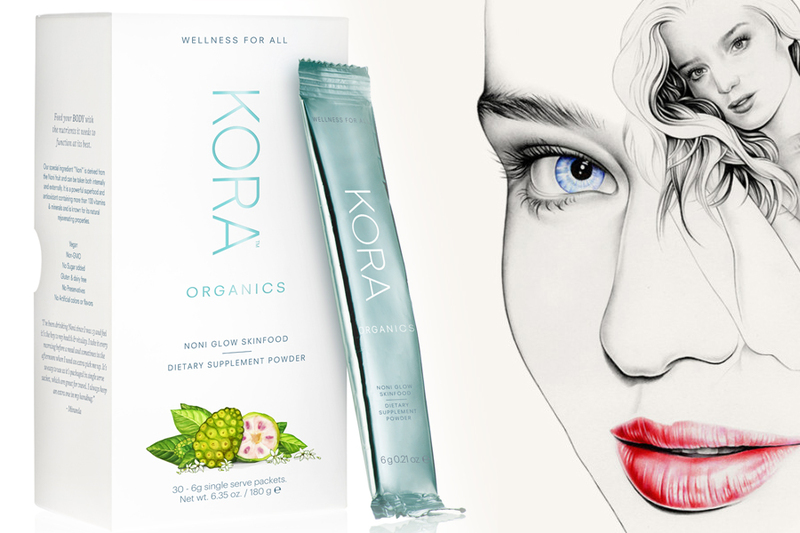 Are their more Noni based Kora products launching soon? All of my products contain Noni Extract, and we have some more exciting products launching…. the next product will launch in February and is one I’m really excited about, it’s a specially formulated oil for the delicate eye area.